TWICKENHAM, London -- Battered, bruised, depleted -- Wales have spent this World Cup defying the odds and they came within five minutes of doing so once again at Twickenham. 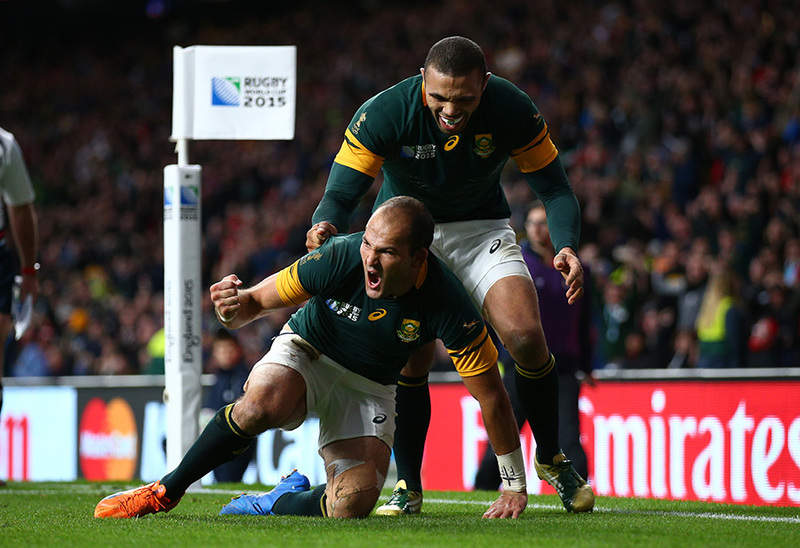 But for a Fourie du Preez try, the northern hemisphere side would be in the semifinals. As it stands, South Africa had the strength and determination to come from behind and clinch a thrilling last-eight victory in front of a raucous crowd at the home of rugby. It was a breathless curtain-raiser for a weekend of quarterfinal action. Talk in the build-up to Saturday's opener was that the big bruisers of Wales and South Africa would play out a tense, direct Test. But what fans inside Twickenham were treated to was an open field with two back divisions eager to run rings around each other. Dan Biggar was full of invention in the Welsh No.10 shirt, while Du Preez constantly tested George North's turning circle with a series of sneaky crossfield kicks. Invention and guile from both sides had the crowd roaring and their coaches chewing fingernails. Wales started the brighter of the two, heaping pressure on the South African line and perhaps catching their opponents off-guard with the ferocity of their game. The Six Nations outfit almost went over in the early exchanges after George North broke free on the right. He was brought down with the tryline yawning, but Wales worked it out to the left and were only let down by a lofty pass from Gethin Jenkins that flew over Tyler Morgan's head and into touch. The Springboks as a unit were reeling, but in Handre Pollard they have a fly-half with a cool head on young shoulders. Despite Wales' early pressure, the South Africans were let off the hook with a series of kickable penalties, and Pollard duly obliged with each opportunity. They might not have particularly threatened the Welsh tryline in the opening 40 minutes, but Pollard kept the scoreboard ticking. The first try went to Wales, and richly deserved. Biggar, who must be recognised as one of the players of the tournament, set things off with an excellent up-and-under. Catching his own kick, the fly-half went to the South African five-metre line before offloading to half-back partner Gareth Davies. The scrum-half shook off Pietersen to dot down and send the Welsh fans, who appeared outnumbered by their South African counterparts, into a frenzy. Despite being down in the try-count, South Africa looked as though they would go into half-time in front thanks to Pollard's penalties. However, that man Biggar was to be the difference once again, as he slotted a dropped goal to send his teammates into the lead. Those in the press box wondered if the second period could live up to the frantic pace of the first. The answer was an emphatic yes. 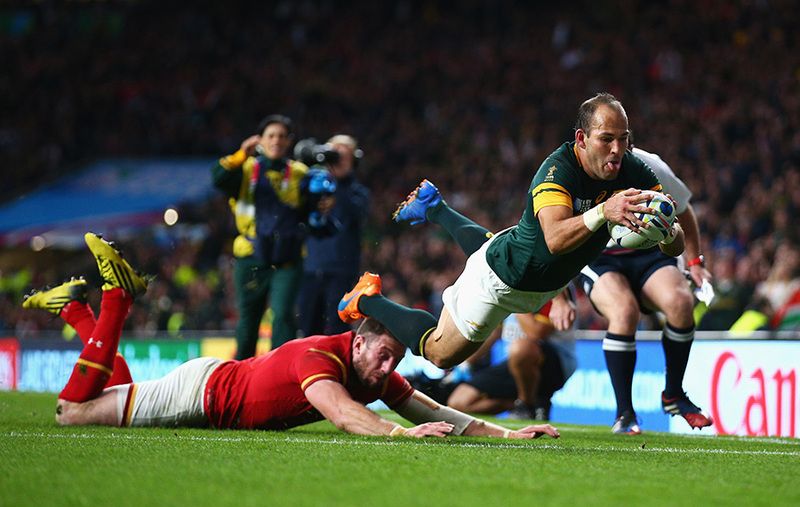 As Wales had dominated the opening exchanges, so South Africa ruled after the break. The Springboks began to play more of their own brand of rugby, with the likes of giant forwards Schalk Burger and Eben Etzebeth carrying more often. They were only denied a series of try-scoring opportunities by some inspired last-ditch tackles, with Alun Wyn Jones, Sam Warburton, and Dan Lydiate -- playing with a metal plate in his eye-socket -- working like men possessed in the Welsh defence. Pollard's kicking boots deserted him for chunks of the second half, but the Springboks were banging on the Welsh door and were left scratching their heads over how they were kept out. That would all change with five minutes remaining. Wales had made a good first of relieving the pressure piled on them by the South Africans, but the replacement of Biggar on 74 minutes proved to be a distraction. The fly-half was brought off after a knock to the head and spent the walk to the touchline pleading with the medic to let him stay on. While he raged on the bench, the Springboks flew down the blindside and skipper Du Preez capped a fine individual performance with a last-gasp try in the left corner. In a week dominated by Ireland's injury woes and the suspension saga of Scotland's Ross Ford and Jonny Gray, Wales' own injury crisis has slipped down the news agenda, but it should not be forgotten they are without eight first-choice players. They came within a whisker of making their second successive World Cup semifinal. The game at this level is about fine margins and Wales will return to their clubs heartbroken, but they can leave with their heads held high after battling against the odds to make it this far in the tournament. The memory of Japan's defeat of South Africa, however, seems a long time ago indeed.